RoofCrafters specializes in top-of-the-line metal roofs. Metal roofing is a smart choice for homes in Austin neighborhoods. This durable choice is eco-friendly and beautiful. You can refinish your whole roof or just add a standing seam metal roof accent to create an attractive, distinctive look. Choose from galvalume, aluminum, copper, zinc or a whole array of designer colors. We offer Double Lock, Single Lock Standing Seam or Snap Lock Panels to create the right roof for your home. There are many advantages to onsite manufacturing, including having panels and siding cut to your exact specifications, no damaging shipments, eliminating unsightly vertical seams, and eliminating possible roof leakage! It’s not only cost effective but if a panel gets damaged, a new one can be created instantly, without any delays. 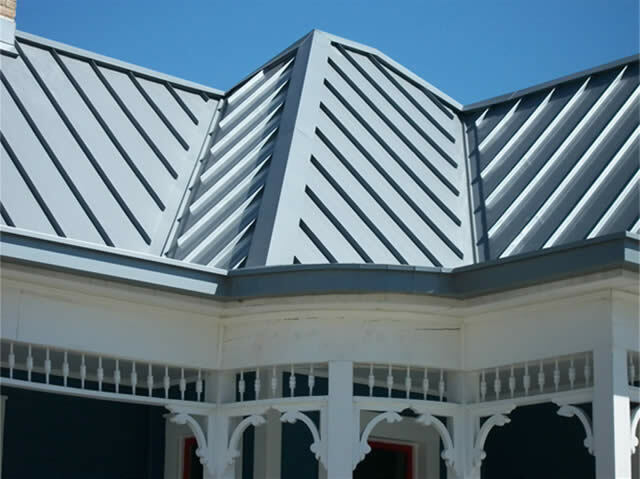 Unlike many competitors, RoofCrafters custom makes most of the accessories for our metal roofs out of the same 24 gauge steel, for matching valleys, ridges, chimney caps and flashings, in our own state of the art metal shop. Talk to one of our Project Planners today about your options in roofing, or contact us for a proposal.